For the past year Avital Globerman and Dan Allon, Hotem magazine’s editorial team, have been creating a bi-weekly comics telling stories from behind-the-scenes of the magazine’s editorial. 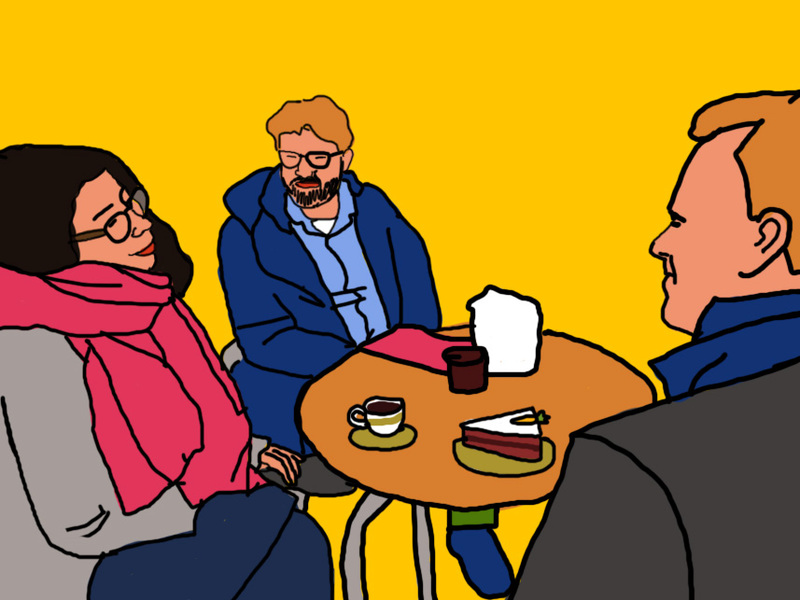 I was really curious to learn more about the comics and the creative process, and was glad to have the opportunity to sit down on a chilly and sunny afternoon in Prenzlauer Berg for coffee and carrot cake, to talk about art, friendship and Berlin. ALON HARRIS: I never knew carrot cake could taste SO good! DAN ALLON: Can you please pass me your napkin? HARRIS: Sure! Can I offer you some cake? AVITAL GLOBERMAN: He’s got to draw something, he can’t help himself… give him a minute and he’ll be back to normal. I know what it feels to have that burning urge to put something down on paper. Maybe that’s why we get along so well. HARRIS: Is it OK if I ask a few questions? HARRIS: first of all, where did you guys first meet? GLOBERMAN: I guess it began when I was reviewing candidate materials for one of the Hotem’s issues. Dan sent me a painting he created and I was literally blown away by the art. Some years later, we happened to meet face to face at one of Dan’s exhibitions at an art gallery in Jaffa-Tel-Aviv. We instantaneously clicked and it was obvious to both of us that we needed to find a way to work together. A while later, Dan was looking for a new artistic endeavor and I was looking for an artistic partner. The timing was perfect for the both of us. It was then that we decided to experiment with comics inside Hotem. HARRIS: Why comics? I thought your focus in Hotem is on high forms of art such as poetry and literature. GLOBERMAN: First of all, I think comics is a very high form of art. It’s a text just like a poem or a painting and just like them it is charged with symbolism and meaning that need to be read and deciphered. For a long time now, I have been dreaming about fusing poetry and comics and creating a poetic-comics or comic-poem. Working with Dan has finally made this possible. HARRIS: where did your love affair with comics begin? ALLON: I guess you could go back as far back as 6th grade when a friend of mine and I signed up for a comics course in our local library. One of my strongest memories after that was exchanging comics via letters with a pen pal who was passionate about comics just as much as I was. I have the original letters at home till today. In those early days I still didn’t have a style of my own and I relied mainly on copying the comics I loved, especially the European ones like Asterix. After that I took a very long break and only returned to drawing comics in 2009 during my Visual Communications studies in Shenkar College of Engineering, Design and Art. It’s been an integral part of my artistic expression and journey ever since. HARRIS: What are the key skills you need in order to be a good comics artist? ALLON: If you know how to draw well but don’t know how to write well – it’s OK. If you know how to write well, but don’t know how to draw well – I guess that’s alright too. If you know how to do both well – that’s ideal! As a comics artist your primary focus is on figuring out how to tell the story you see in your vision. Your work doesn’t necessarily have to be technically beautiful as a painting, or articulated as well as a novel or poem. You need to develop your own way of navigating between both worlds. HARRIS: the heroes of the comics that you create are actually you two. What was the logic behind this choice? GLOBERMAN: Dan and I thought it would be really funny to provide our readers with an inside view into what goes on behind the scenes of Hotem. So, we drew on our real-life experiences as friends and artistic collaborators and created world behind a world. In order to add another dimension of both meaning and humor – we decided that the heroes of our comics will be our alter-egos as people and as artists. They are an extreme, comic and sometimes pathetic versions of ourselves: Dan’s character is a neurotic, hysterical, and hypochondriac artist. He’s also really clumsy: he has the best intentions but most of his efforts eventually fail. ALLON: Avital’s character is a slightly delusional magazine editor whose sole purpose in life is to dominate the art world and make the biggest and best art magazine of all times. She walks through life seeing everything, even the most mundane events and objects, as an opportunity to artistically correspond with the world’s most famous works of art, literature and poetry. HARRIS: What’s the creative process for creating a comics? GLOBERMAN: It’s actually really fast and intuitive. Sometimes something funny happens to me or I hear a funny word or story, I get a “comics vision” and immediately contact Dan. Sometimes it’s Dan that gets the vision first and contacts me. We have a very deep understanding of how each person thinks, so it’s often just a fun process where we get to make each other laugh. ALLON: Over the years I got used to drawing on my own and I just love the fact that I can now do this with a friend and collaborator. The creative process basically follows a very simple rule – if the comics makes us laugh – it’s in! GLOBERMAN: The creative process is also strongly connected to our friendship. We are constantly sharing our personal moments and stories. They are the raw materials of many of our comics. ALLON: Sometimes the comics are a portrayal of an event, and sometimes they are as intimate as a confession. GLOBERMAN:I think that the most interesting insight I gained from experimenting with comics is how liberating it is as an artistic medium. As someone who has spent years expressing herself through the media of poetry and literature, I suddenly discovered that comics enabled me to say things I just couldn’t say in sentences or rhymes. From an artistic collaboration standpoint, I also found that sharing the responsibility of creating the comics together with Dan also enabled me to stretch the limits of my comfort zone even further. This might sound funny, but when I wanted to express something sensitive or controversial, I just closed my eyes and imagined that people would read the comics and naturally attribute it to Dan. This gave me even more freedom. HARRIS: Dan, what’s your take on this from your perspective as an artist? ALLON: Some artistic genres, such as poetry or literature, have hundreds of years of history. So, I feel that as an artist in these media you have to, for better or for worse, carry the burden of history on your shoulders. I think it can sometimes be a limiting, if not paralyzing, experience as an artist. Comics, on the other hand, is relatively new and fresh and people usually perceive it as a medium for humor, although you can certainly use it to deal with very somber topics. People approach comics with open hearts and minds. It’s magically likable. It’s coated with naivety. For me, working with someone like Avital, is an opportunity to find a way to use this naivety to convey complex messages that would be much harder to convey or digest in other mediums. We sometimes joke that we are basically luring people in with comics, but placing “Trojan Horses” inside of them. HARRIS: do you feel that there is any added benefit to having a 2 dimensional and still comics strip on a digital platform such as the Hotem? GLOBERMAN: Absolutely! What Dan and I have created is basically a “comics blog”. Instead of writing about the events and experiences that are shaping Dan and my artistic journey, we are drawing them and immediately posting them via our digital channel. Our life-strip is now a comic-strip. Moreover, the Hotem readers are now able to observe and be part of our journey as they follow us through this medium. Sustaining and growing the community of artists and viewers is an important part of Hotem, so this fits in great with our mission. HARRIS: As artists, both of you are originally from Tel-Aviv and are now based in Berlin. How do you approach different cultural backgrounds in your work? GLOBERMAN: First of all, Hotem’s platform had undergone a serious transformation in order to be accessible to new, international audiences. We introduced our English site a year ago, are launching now a German site, and have plans on expanding into other languages. This shift is also reflected in our comics. Many of our comics over the past few months have dealt with our own transition from Tel-Aviv to Berlin. Our comics heroes or “alter-egos” are now exploring things that are connected to Berlin and to German culture. The neighborhood we live in, Berlin monuments, and even Angela Merkel have all found their way into our comics. ALLON: We are totally aware of the fact that we are foreigners, and like foreigners we make a lot of funny mistakes because we don’t really understand the culture or because we assume we do. One of our latest comics, for example, depicts our characters going to the Board of Foreigners (Ausländerbehörde) on a Sunday just to find out that it is closed, and my character’s silly reaction is “well, it must be because of the snow”. HARRIS: Tell me about the upcoming issue and event in Berlin. ALLON: The next issue will host me and my fellow comics artists from the Humdrum collective: Karen Katz, Hadar Reuven, Hila Noam and Omer Hoffman. We have been collaborating since 2013 on a number of international comics exhibitions, performances and we have also published a book, which can be found online. The issue will focus on the theme of “Snow” and for us as comics artists this is a great theme as it is inherently visual. We have been invited to take part in Comics Invasion Festival in Berlin. We are going to combine the launch of The English issue #2, “snow” (which features Humdrum collective), and the festival, so that we can provide people with a 360 degree comics experience, both in print and digitally, both in Berlin and around the world.